What if we told you that you can earn extra income just by carpooling with others? In fact, you can now earn more than a part time job when you drive with GrabHitch! Isn’t it cool when you get to earn extra pocket money ,reduce traffic congestion and reduce environmental impact, all at the same time! If you already didn’t know, being an active drivers allows you to earn up to 1.5x more as compared to having a part time job. The more you hitch, the more you earn! The sky is the limit! Here is the comparison of benefits between GrabHitch vs Part time job. **Student Bonus: You will be entitled to the RM50 student bonus and stand a chance to win a pair of movie tickets based on the programme period and eligibility stated below. 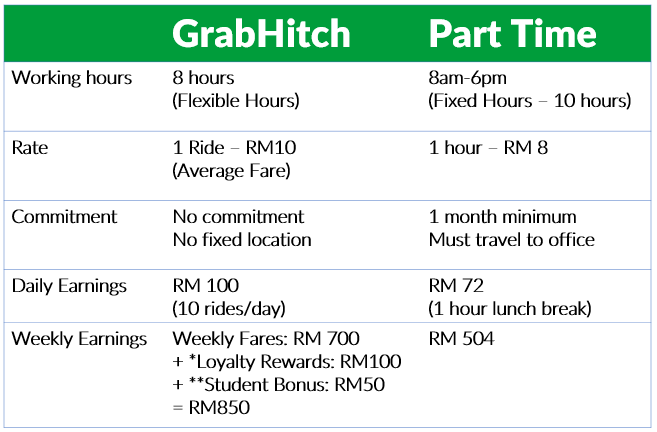 GrabHitch has a minimum fare of RM7, you get to keep 100% of the earnings from ride. How cool is that? On top of the regular fare you collect, GrabHitch rewards you when you complete more rides and stay active regularly in a month . Check out GrabHitch Loyalty Program. When you refer a friend to join you as a GrabHitch driver, you both get RM15 when he or she completes their first ride! The more, the merrier! With the new Quick Hitch feature, you will be able to hitch with nearby passengers around you. Hitch with passenger hassle-free during your leisure time. This promo is valid everyday starting from 28th November 2016 – 16th December 2016 . Cancellation without proper reason, attempt to fraud, and overcharging are strictly not tolerated and will result in disqualification from this campaign. All complaints against drivers (e.g. late pick up, frequent cancellations, fraudulent activities) will be investigated and may result in disqualification from this promo. Drivers must strictly adhere to our Driver’s Code of Conduct . Rides completed during this campaign will also contribute towards our November Driver Loyalty Program. This promo is only applicable to selected GrabHitch drivers contacted via SMS, email and in-app notification who have already signed up with GrabHitch. All decisions by GrabHitch are final, including the details of this promo and no correspondence will be entertained. We also reserve the rights to ensure drivers and passengers are genuine in utilizing this campaign, and any suspected fraudulent activities will have action taken against them according to GrabHitch’s usual SOP.